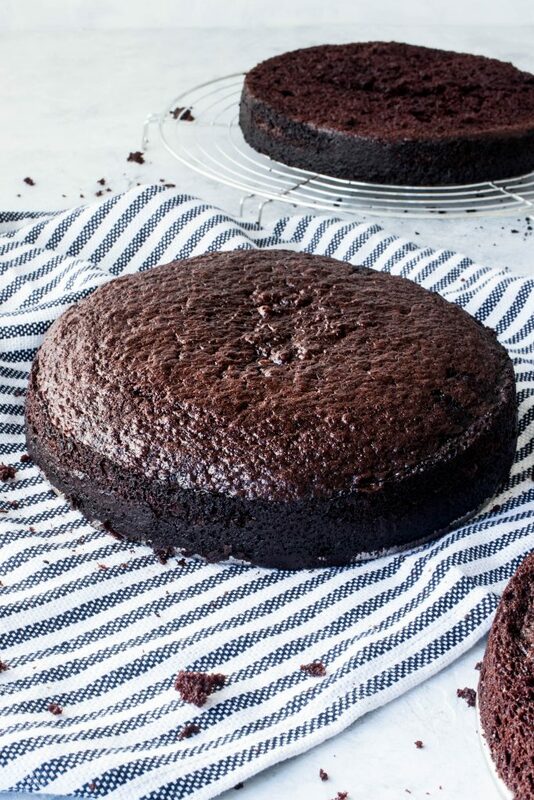 This chocolate cake recipe is tender and moist, but still sturdy enough to create beautiful layers or decadent cupcakes. A one bowl recipe, it’s also incredibly easy to make! Do you have those recipes you go back to over and over again instinctively? In a pinch, you know you can pull that recipe out of your hat and it’ll be perfect and reliable and just what you needed. It’s kind of like the perfect little black dress, you know? 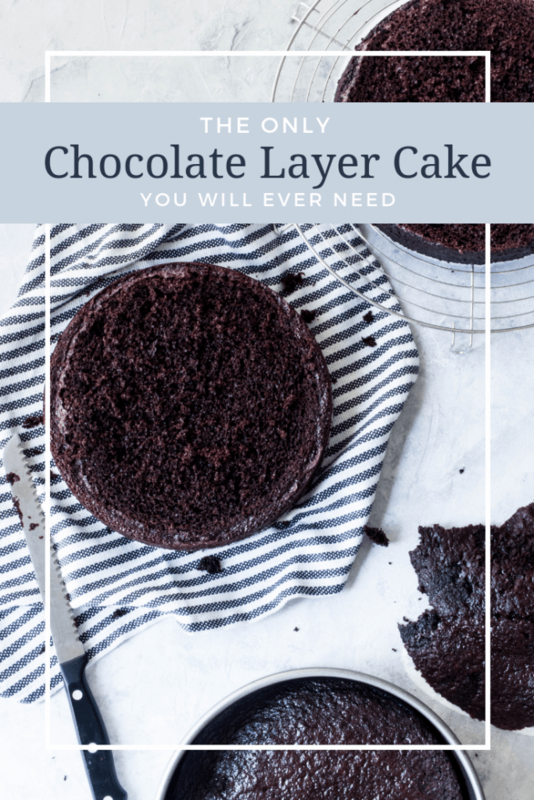 I feel like this chocolate layer cake is really the LBD of the cake world—versatile and perfect for any occasion and accessory. I simple layer of buttercream (+sprinkles, of course) will give you a comfortable, homey dessert. Stacking up layers with filling in between and decorating them will give you something stunning for a dressier offering. Anything in between, and you’re still getting cake gold. 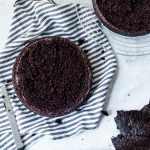 Not only is it rich and dark and chocolatey, the crumb is delicate and moist, while still being sturdy enough to be layered. It’s good. I mean really, really good. Micah, who’s definitely in the take it or leave it camp with cake, enjoys this one. He snitches little bits of the top bump that I level off when he walks by, and lets me know that this one is a-ok. And of course, my boys, with very refined palates from 4 and 1 years worth of experience, absolutely love it. Though I think they may actually be more excited about the frosting. Kids these days, I tell ya. And it’s so. stinkin’. easy. I mean, one bowl. One spatula. A sifter for the dry ingredients and BAM, you’re in business. You’ve even got options, since I’ve halved and multiplied the recipe for you to make the number of layers you need in either 6 or 8 inches. It can also be cupcakes, because we all need more of those in our lives, especially pile high with fudge frosting and sprinkles. Me these days, I tell ya. Preheat your oven to 350 degrees f, then grease two 8” cake tins and sprinkle them with cocoa powder. In the bowl of a stand mixer, combine all of the wet ingredients together and mix on low until well combine. Sift in the dry ingredients, then stir on medium low for about 2 minutes, scraping the sides and bottom of the bowl with a spatula to make sure that all of the ingredients are being mixed together. Divide the cake batter between the two cake pans and bake for 28-30 minutes, or until the top of the cake springs back when you tap it very gently. Alternately, you can insert a toothpick and make sure it comes out clean or with only one or two crumbs on it. Remove the baked cakes from the oven and allow them to sit in the pans for 5-10 minutes before turning them out onto cooling racks. Allow them to cool completely before leveling or decorating. 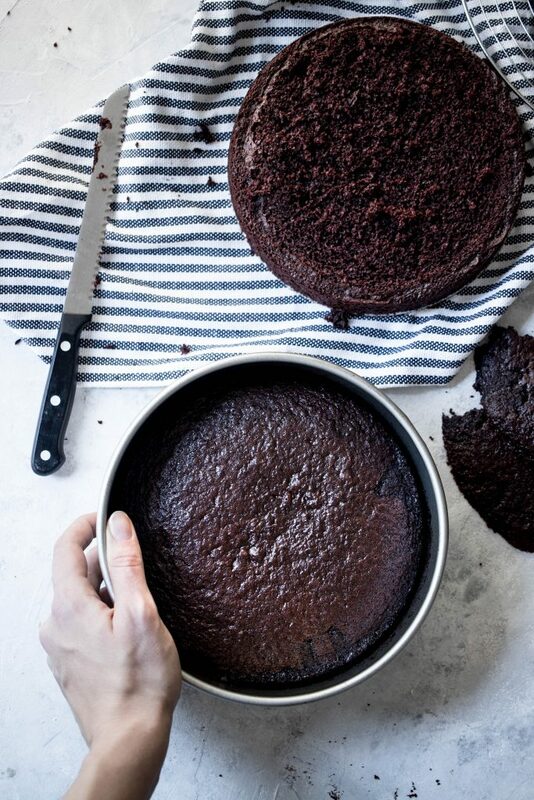 To ensure that your cake will come out without leaving any chunks behind in the pan, I recommend spraying it well with baking spray, then sprinkling with cocoa powder. Tap and turn the pan around to spread the cocoa powder and cover all of the surface. 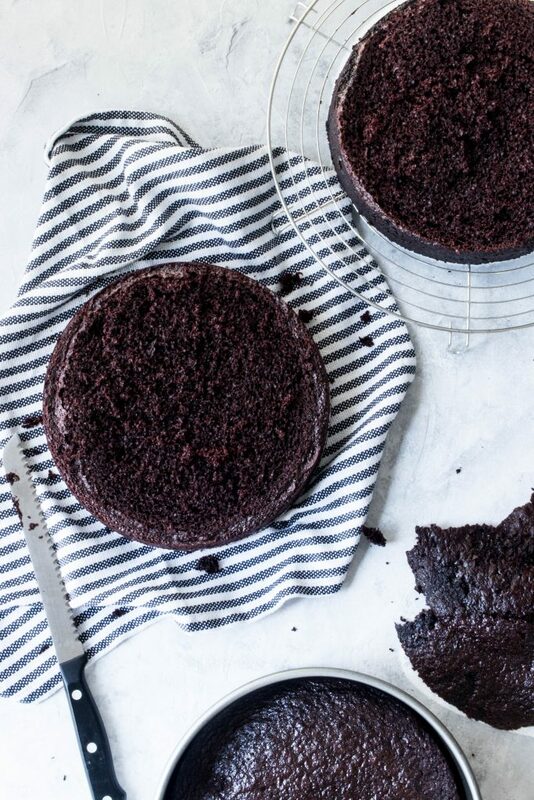 Using cocoa powder rather than flour to dust the pan helps keep the cake crust looking dark and chocolatey. Flour works also, but it may leave a lighter “film” around the edges of the cakes. Let the cake cool completely before handling and leveling it. It is fairly delicate when warm, and you don’t want it falling apart on you. These cake layers will freeze like a dream! Wrap each one well in plastic wrap and freeze for up to two week.